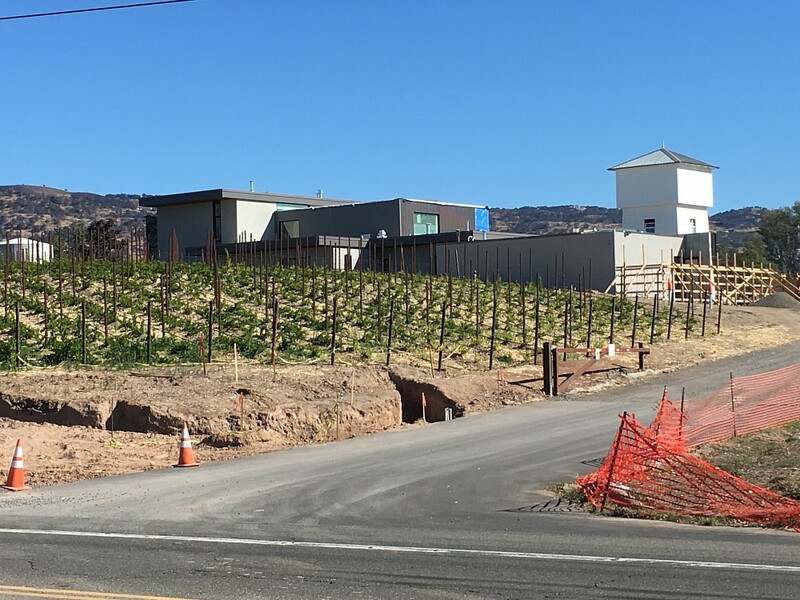 Yet another winery has been proposed at the Soda Canyon Junction. As I have lamented in "The end of the trail" the winery congestion at the Soda Canyon intersection with the Trail has been a particular concern both on the impact in this one corner of the county and as a harbinger of and prototype for continued winery development on every possible parcel in the county. 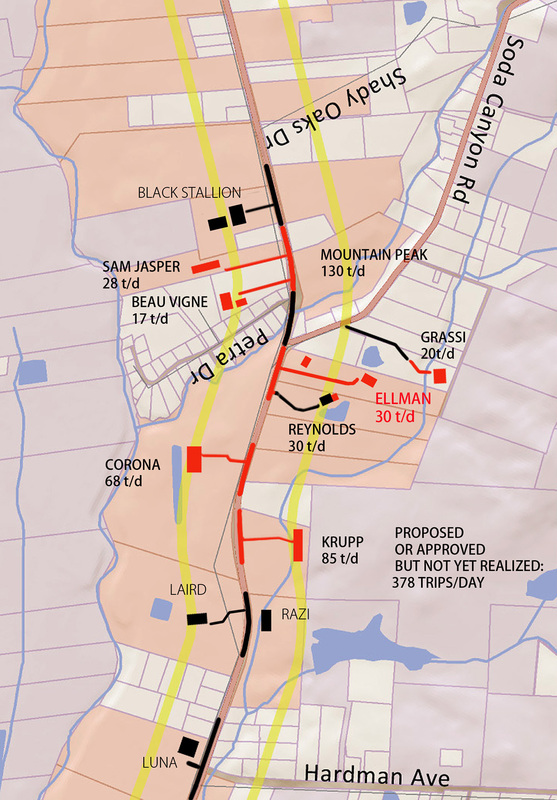 And the eventual demise of the Trail as an iconic piece of Napa landscape. The County's Ellman page is here and I will continue to follow the project as it makes its way through the Planning Commission. As usual with current winery proposals, the visitation request is modest. Given community pushback in the last few years, becoming established with low numbers and then ramping up with future requests seems an easier route than starting out at full ambition. The production request of 30,000 gal/yr (above the median size of 20,000 gal for wineries in the county) also seems to be the current starting number for new wineries. It represents perhaps 4 times the amount of wine that can be produced from the 14 acre site. There's a logic to allow larger capacity on small sites because, in theory, fewer wineries need to be built to process the Napa grape crop. The reality is, however, that there are already enough winery capacity in the county to process all available Napa grapes several times over. This winery, like most other being approved, will make wine from vines that are currently used by some other winery. It will add only another building to the Napa landscape and no more wine to the Napa wine industry. Note that in terms of the real wine industry, Ellman, like Mountain Peak proposed next to me, already makes wine and markets it through tasting rooms in town and in online portals. The Mountain Peak brand is also marketed through a distributer. None of these projects are about making wine - they are about catering to more profitable (and/or ego boosting) entertainment uses. Unfortunately, by ignoring the reality that these projects would probably not be built without the justification of the profitability of direct-to-consumer "experiences", the County is continuing to promote the urbanizing impacts that the tourism industry is having on county infrastructure, resources and quality of life. The Ellman Winery proposal also highlights another issue: The very un-residential Ellman house that has been under construction on the site this last year is an unfortunate example that treating homes differently from wineries in terms of setbacks and coverage and community review is as destructive as winery development to the rural character that the county claims to protect. I know that in the past efforts have been made link the two types of building projects under one set of ordinances when it comes to their impact on the land, and I hope the County is continuing with those efforts. The purpose of the winery ordinances to protect Napa's rural character is a mockery if homes, many as large as a winery, can continue to be built ignoring those protections.